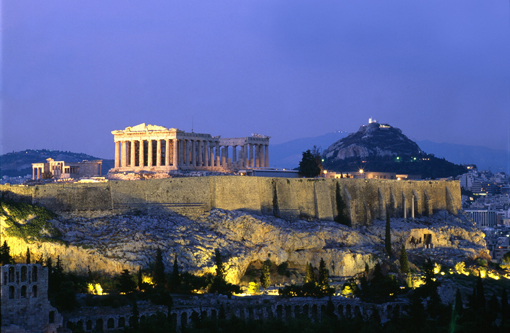 There are few countries in the world whose history and culture can be compared to that of Greece. It is not surprising that there are innumerable, great historical monuments and archaeological sites from the smallest to the largest city of this country. But between all these sites with big cultural heritage, there are 18 who stand out. They are the 18 Greek UNESCO World Heritage Sites. Temple of Apollo Epicurius was the first monument in Greece that was declared a World Heritage Site by UNESCO in 1986. It is located in the center of the Peloponnese, in Figalia, between Ilia, Arcadia and Messinia, and is one of the best preserved monuments of classical antiquity. It was built by Iktino in the 5th century BC and was dedicated to the god Apollo who helped the people of Figalia to overcome a plague epidemic. According to greek mythology, Zeus once liberated two eagles and asked them to meet over the center of the earth. The eagles met over Delphi, and since then Delphi was considered to be the omphalos (navel) of the earth. But this is not why UNESCO declared Delphi a World Heritage Site in 1987. In the city of Delphi was the most important oracle of the ancient Greek world. During its operation, all Greek cities and many of the cities built around the Mediterranean were consulted the oracle when making important decisions. The most recognizable and visited landmark of Greece, the Acropolis of Athens is in the UNESCO World Heritage List since 1987. This rocky hill, in the center of Athens, hosts four of the top masterpieces of classical Greek architecture. Parthenon, a Doric temple entirely made of marble and dedicated to the goddess Athena, whose construction lasted for 15 years from 447 to 432 BC under the directions of the architects Iktinos and Kallikrates. Propylaea, the impressive entrance of Acropolis built in 436 BC after the completion of the Parthenon but never completed because in 431 BC the Peloponnesian war began and the work was over. Erechtheion was built between 425 and 406 BC by architect Kallimachos and is one of the masterpieces of the Ionian style. Inside the temple was divided into two parts, the eastern part facing the facade was dedicated to Athena and the other to Poseidon. The temple of Athena Nike is a small temple, made entirely of marble that built between 427 and 424 BC by architect Kallikrates. 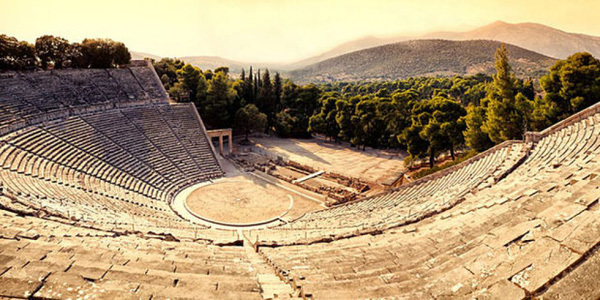 Sanctuary of Asklepios at Epidaurus belongs to the UNESCO World Heritage Sites since 1988. It is located in the Peloponnese, in the area of Epidaurus and was built in the 6th century. It is located where a sanctuary dedicated to the god Apollo used to be, who according to mythology was the father of Asclepius. Sanctuary of Asklepios at Epidaurus was also the most famous healing center of the ancient Greek and Roman world. The city of Thessaloniki played an important role in ancient years but also during Roman and Byzantine years. 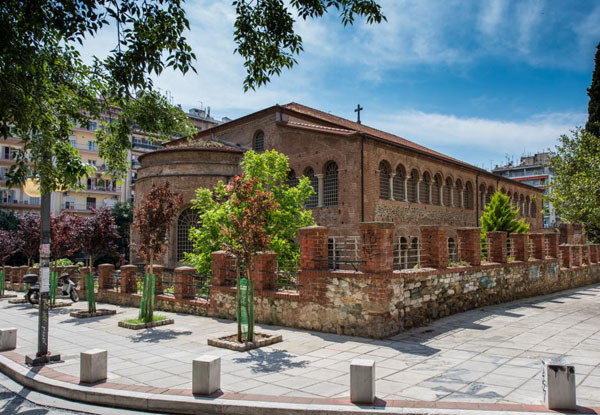 It is therefore not surprising that UNESCO has declared 15 Early Christian and Byzantine Monuments of Thessaloniki as World Heritage Monuments since 1988. Some of these monuments are Rotunda, Saint Dimitrios, Hagia Sophia, the Byzantine walls, the basilica of Panagia Acheoporatikos and The Byzantine baths. 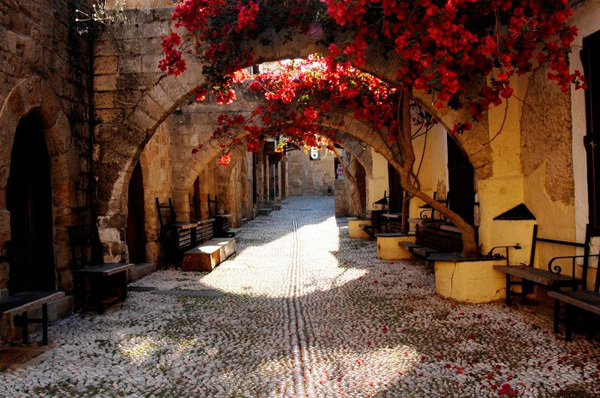 The medieval city of Rhodes is a UNESCO World Heritage Site since 1988 and therefore no change in the appearance of the buildings is permitted before it is approved by the archaeological service. The Order of St. John of Jerusalem captured Rhodes from 1309 to 1523 and set out to transform the city into a fortress. The fortress consists of two distinct urban formations, the Kollakion in the north and Chora in the south. Kollakion, is one of the most beautiful buildings blocks of the Gothic period, includes the well-known Knights' Road, the Grand Master's Palace, the Hospital that has been transformed into a museum, the Churches of the Order and other major buildings. In Chora there are the Turkish bazaar around Suleyman's mosque, the old market and other buildings of tourist interest. 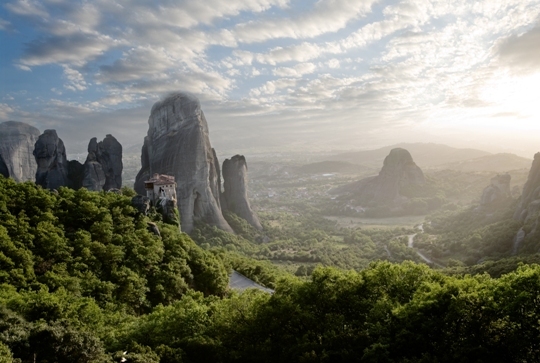 Meteora entered the UNESCO list as both a cultural and a natural attraction. Located in the center of Greece, just outside the city of Kalambaka, stand these huge rocks that seem to reach the sky. 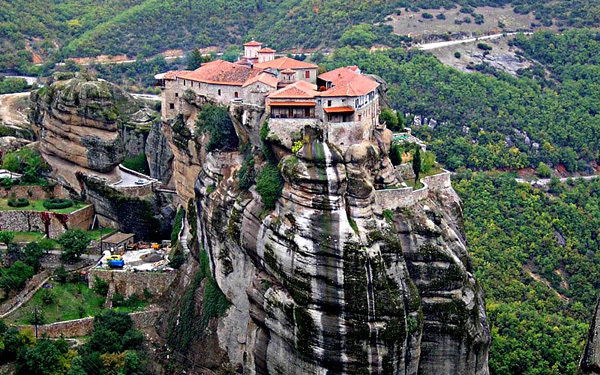 The rocks, according to the geologists, formed about 60 million years ago and above them are built the Meteora Monasteries, of which today only 6 are accessible. 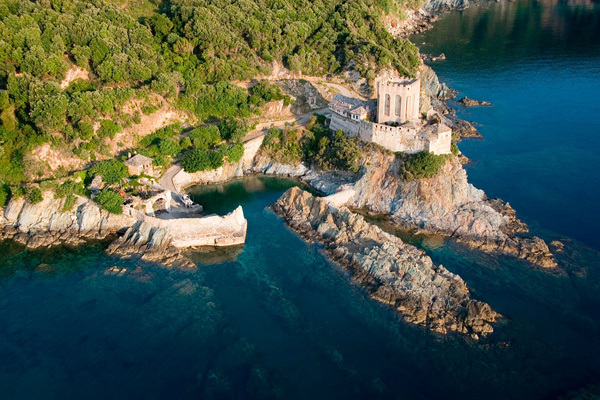 In 1988 Mount Athos was also declared a World Heritage Site by UNESCO. It is located on the peninsula of Athos in Halkidiki and according to the Constitution of Greece it is a self-governing part of the Greek state, while it is unofficially characterized as an Autonomous Monastic State. It consists of 20 monasteries and houses about 1,800 monks. In the Western Peloponnese is one of the most important monuments of ancient Greece. 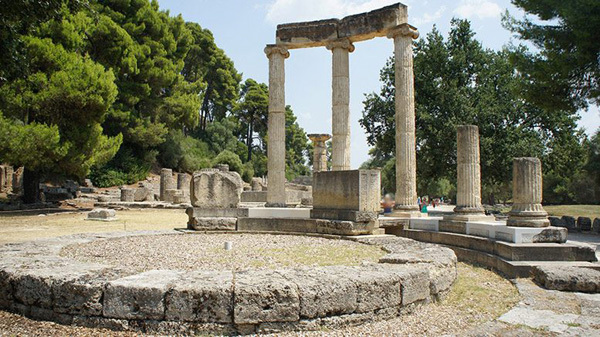 The archaeological site of Olympia was dedicated to the god Zeus and has been a UNESCO World Heritage Site since 1989. Olympia is considered to be the most important religious and sports center in ancient Greece. This is where the Olympic Games, the most important sporting institution were born. Some of the most important monuments of Olympia are the Temple of Zeus, where was the statue of Zeus, the work of Pheidias, which was known in antiquity as one of the seven wonders of the world, the Temple of Hera, the Prytanio, The ancient stadium and the aqueduct of Herodes Atticus. The founding of Mistras is associated with the first crusade of Constantinople by the Crusaders in 1204. At that time the Peloponnese is granted to the Franks, and William II Villarreal in 1249 will build his castle on the eastern side of Taygetus in a region called Mystras Or Myzhythras. After the defeat of the Franks in the battle of Pelagonia in 1259, the castle of Mystra was granted to the Byzantine emperor Michael II Palaiologos. Over the years, Mystras has expanded its power throughout the Peloponnese and became the focal point of the political and intellectual life of the Empire, as well as the center of literature and the arts. 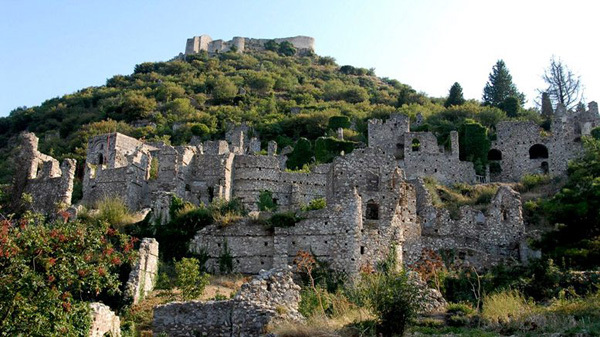 In 1989, by Unesco's decision, Mystras is included in the list of World Heritage Sites. Although geographically these three monasteries are far enough apart, they share several common elements which made Unesco to include them in the World Heritage Sites in 1990. The Daphni Monastery was founded in the 6th century on the ruins of the temple of Daphne Apollo. Its impressive architecture and special mosaic decorations make it one of the most remarkable monuments of Byzantine art. The Monastery of Hosios Loukas is probably the most important monument of the Middle Byzantine period in Greece. It is a large building complex, whose oldest buildings date back to the 10th century. The New Monastery of Chios is an old historical monastery, founded in 1042 AD with imperial sponsorship and is known worldwide for its exceptional mosaic art. The island of Delos has been one of UNESCO World Heritage Sites since 1990. 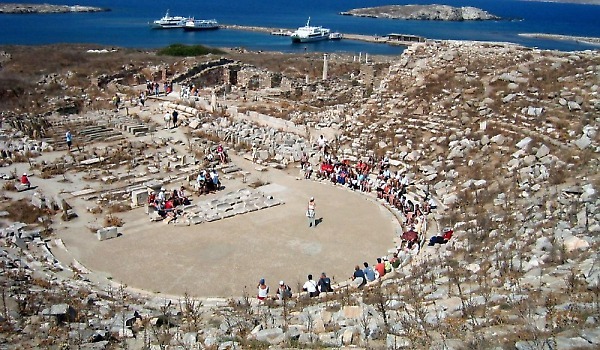 It is located in the center of the Aegean sea and belongs to Cyclades. In antiquity it was considered a sacred island, because here was born the god Apollo and goddess Artemis, two of the most important gods of the Greek pantheon. It is estimated that at the beginning of the 1st century BC on this small island inhabited about 30,000 people and that in its ports it was possible to carry 750,000 tonnes of goods every year. This wealth, however, gathered on the island, as well as the friendly relations of people of Delos with Rome, was the main cause of the disaster. Delos was destroyed and plundered twice: in 88 BC by the king of Pontus Mithridates, who was in war with the Romans, and in 69 BC by the pirates of Athinodoros, who was Mithridates' ally. Since then the island has been declining and gradually abandoned. 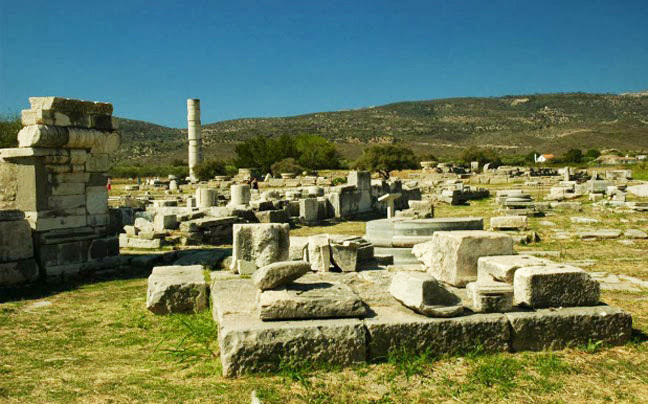 Ancient Samos (Pythagorion) was one of the most important cities of antiquity. It is therefore logical that two monuments of this small island have been among the Unesco World Heritage Sites since 1992. The first is Pythagorio, an ancient harbor with impressive Greek and Roman monuments and a remarkable aqueduct. The second, Heraion of Samos is the place where the ruins of the ancient temple of the same name are located, which was dedicated to goddess Hera. 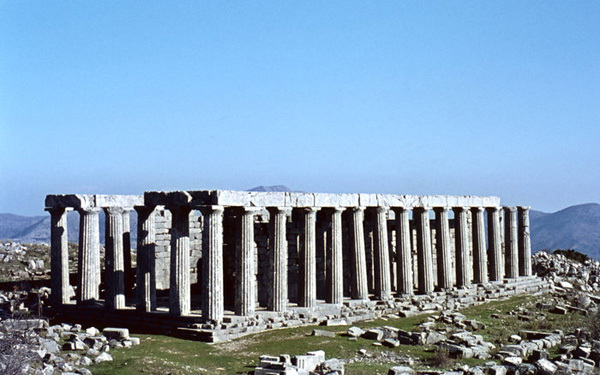 According to Herodotus, Heraion of Samos was the largest temple in Greece. It was a Ionic pantheon with 155 giant pillars, of which only one remains upright today. The small town of Vergina in the prefecture of Imathia is situated at the site of the ancient city of Aigai, the capital of ancient Macedonia. The area became known worldwide when, in 1977, the professor of archeology Manolis Andronikos and his colleagues discovered the burial sites of Macedonian kings and among the other tombs a burial monument owned by King Philip II, the father of Alexander the Great who had been assassinated in 336 BC, in the theater of the city of Aigai. 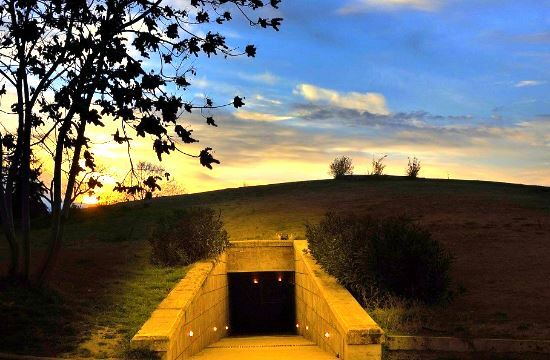 Since 1996 the archaeological site of Vergina is a UNESCO World Heritage Site. Mycenae and Tiryns are two of the most important cities of Mycenaean Greece, which flourished between the 15th and the 12th century BC. 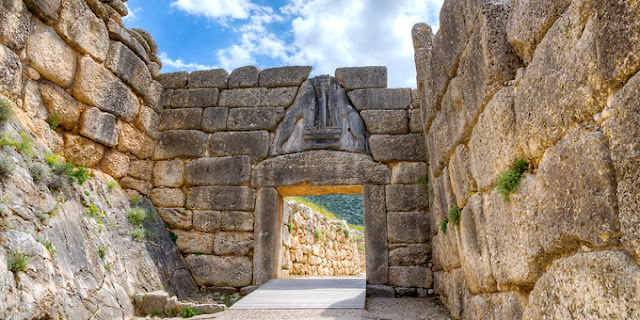 The great peak of Mycenae coincided with the Late Bronze Age, between 1350 and 1200 BC. It is then that the first monumental graves began to be built. From then on, the development is dizzying. Palaces, walls, the well-known "Treasury of Atreus", and bastions form one of the largest architectural complexes that the ancient world has experienced. Ancient Tiryns was famous for its fortification. The walls that preserved the palaces were so impressive that the ancient Greeks did not believe they were made by human hands, but as the myth says, the Cyclops themselves built them. Since 1999, the archaeological sites of Mycenae and Tiryns are UNESCO World Heritage Sites. The little island of Patmos in the Dodecanese is known as the place where St. John the Theologian wrote both his Gospel and Revelation. The Monastery of St. John the Theologian, dedicated to Christ's "favorite student", was founded there in the late 10th century and has been for centuries a place of pilgrimage and worship. 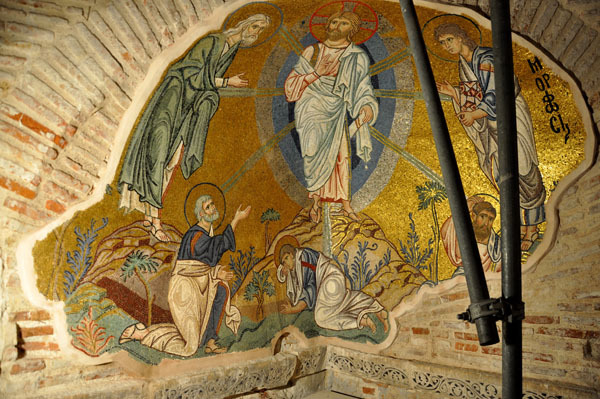 The monastery was built at the point where both the Catholic and the Orthodox Church believed that John the Apostle wrote the Gospel and the Revelation, near the cave where he had found shelter and where he saw the visions of the Apocalypse. 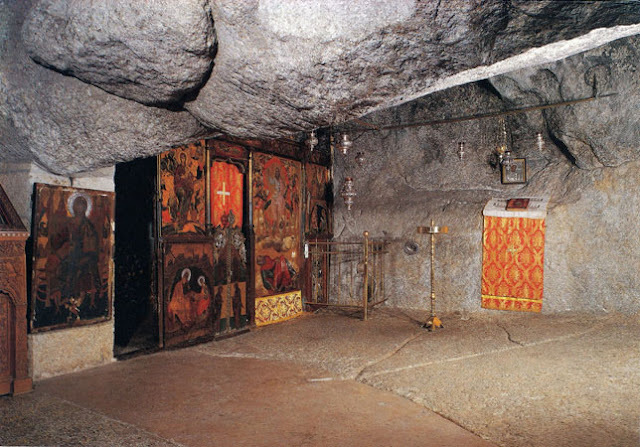 In 1999, UNESCO was declared the Historic Center (Chora) with the Monastery of St. John the Theologian and the Cave of Apocalypse in Patmos as World Heritage Sites. 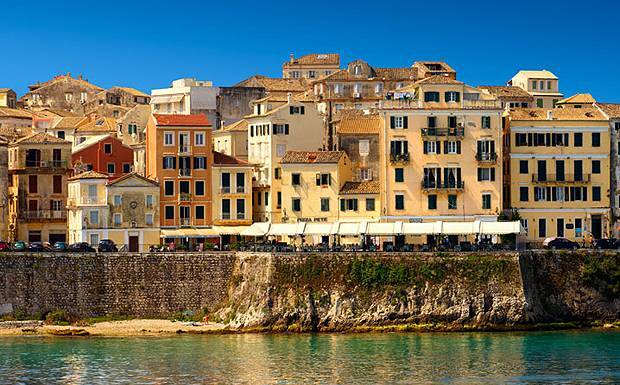 The Old City of Corfu belongs to UNESCO World Heritage Sites since 2007. The island of Corfu on the west coast of Greece is strategically located at the entrance of the Adriatic and has its roots in the 8th century BC. The three fortresses of the city, designed by famous Venetian engineers, were used for four centuries to defend the commercial interests of the Republic of Venice against the Ottoman Empire. Over time, the forts were repaired and reconstructed several times, more recently under British rule in the 19th century. The architecture of the Old City is mainly neoclassical and has its origins in the Venetian period, while a large part of the buildings were built in the 19th century. The city of Philippi in ancient times was located in eastern Macedonia at the point where Kavala is today, while the original name of the city was Krinides. The city was conveniently located on the road linking the East with the West and was founded in 356 BC by King Philip II. After the battle of Philippi (in 42 BC) it was converted into a Roman colony and it was the most important city in eastern Macedonia. 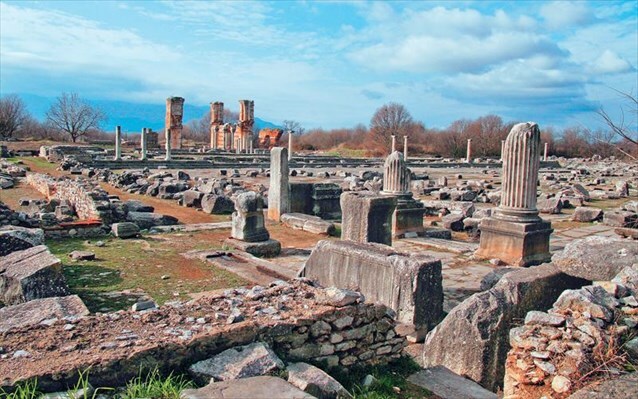 The landmark for the city was the year 49 or 50 AD when the Apostle Paul visited Philippi and founded there the first Christian Church of Europe, which made the city a metropolis of Christianity. The Philippi Archaeological Site is the most recent greek monument added to the Unesco World Heritage Sites, in July 2016.